Naturally Curly: Introduce yourself and your company! 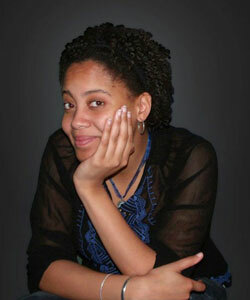 Jasmine Lawrence: My name is Jasmine Lawrence and I am the Founder and CEO of EDEN BodyWorks. NC: Can you tell me a little bit about yourself and how you got started in the hair care business? What about your own personal background and the product line’s background? JL: Although many of my friends and family have had chemical hair treatments without any resulting hair issues, I experienced hair loss and damage as the result of a relaxer “gone wrong” when I was 11 years old. I tried using different medications and various natural products to regrow my hair, but nothing seemed to work. I did some research and uncovered a few natural ingredients with great properties for stimulating healthy hair and scalp growth. Using my allowance and a little help from my parents, I visited different stores in search of the herbs, oils and natural extracts I had been researching. After many trials of mixing formulas and testing my creations on my mom and sisters, I finally found the perfect jojoba based mixture to help me nourish my hair back to its strong, healthy state! EDEN BodyWorks was started in August of 2004 after attending a business camp sponsored by the National Foundation for Teaching Entrepreneurship. This experience inspired me to start a business focused on helping others by sharing my products. In fact, many of the later products were developed from customer ideas and shared stories. The goal of EDEN BodyWorks has always been to make affordable, quality products using natural ingredients… that work! JL: My favorite styles are twists! I believe they work well with my thick texture — not to mention they are fun, flexible and trendy! I alternate between twists and straight styles, as well as braids in the summertime. JL: One of my staple styles, twists, allows me to maintain my curl pattern after I’ve worn my hair straight. I really embraced my curly texture when I began experimenting with natural ingredients like peppermint, jojoba, coconut and tea tree oils. The moisturizing benefits made it easy to self-maintain my hair and prevent further damage. I enjoy the flexibility of curly hair — Afros, twists, wet and wild, etc. All of those styles allow me to flaunt my unique persona through my hair. My curly hair is like an accessory: each day can reflect a new personal style! NC: Let’s talk a bit about the line/products. Can you tell me about it, the ingredients etc.? 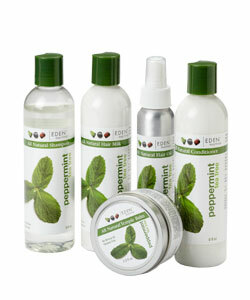 JL: We have two brand families currently, Peppermint Tea Tree and JojOba Monoi. Both lines were formulated with all natural ingredients and have no sulfates, no parabens, no mineral oils and no petroleum/petrolatum. Peppermint oil is great for balancing the scalp’s pH and improving circulation to stimulate hair growth while tea tree oil helps to remove product build up to allow for gentle cleansing. If your hair lacks moisture, the JojOba Monoi line is packed with jojoba and coconut goodness to restore, repair and strengthen the hair. 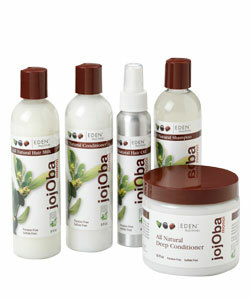 The JojOba Monoi collection is a curly girl’s best friend to achieve hydrated, healthy curls. It leaves the hair feeling amazingly soft! JL: Our products were designed for everyone who desires healthy, happy hair: women, children and men! JL: Curly textures enjoy the cleansing, anti-bacterial and refreshing properties of our Peppermint Tea Tree products combined with the moisturizing benefits of our JojOba Monoi collection. Both lines are packed with essential oils and all-natural ingredients for healthy hair care. Our shampoos and moisturizing conditioners are served up with milks and oils for optimum daily moisture maintenance. You can expect clean, soft, bouncy healthy tresses. NC: Do you have any tips for women who are considering going natural or for new curlies? Trim ends every 4-6 weeks. This helps reduce damage caused by split ends. When moisturizing your hair don’t neglect your scalp. Massage your preferred moisturizer into your scalp and down your hair shafts. When braiding or pulling back your hair, try to avoid too much tension on your hairline. After washing your hair rinse with warm/cool water to seal in moisture. I also recommend detangling the ends, working your way up towards the root or finger detangling before combing. For all textures, I recommend sleeping with a silk scarf or satin pillowcase. It’s a great way to avoid the “friction” caused by cotton pillowcases, which can cause frizz and lead to breakage. JL: Our products work well with almost any style, from wash and go’s, to twists and twist outs, locs, braids and straight or relaxed styles. I personally love rocking twists using the JojOba Monoi Hair Milk. After washing and drying my hair, I part the hair into small sections and apply the hair milk to each section prior to twisting. After twisting the hair, I apply a coconut mousse and blow dry for a few minutes. This leaves my hair soft and bouncy. JL: Using products formulated with natural ingredients is another step in embracing a healthier lifestyle, from the top down. I always encourage women make their “hair product choices” like we do with our food – read the labels and do what works best for you! Don’t forget to drink to plenty of water… it’s the best source for MOISTURE! JL: Join the conversation about healthy hair with @edenbodyworks on Twitter. Don’t forget to sign up for our email newsletter on our website, www.edenbodyworks.com and “LIKE” our fan page EDENBlog on Facebook. Discover EDEN for yourself at Walmart and Sally stores nationwide. You can also find our products online at www.edenbodyworks.com and Shop.NaturallyCurly.com.